On February 15, our spiritual advisor and dear friend Gelek Rimpoche died. A renowned Tibetan Buddhist teacher—whose students included poet Allen Ginsberg and composer Philip Glass—Rimpoche led our inaugural retreat at the Garrison Institute in 2003. In 2001, when we first learned that an old, well-maintained Capuchin monastery was available in Garrison, New York—about 50 miles north of New York City on the Hudson River—our first instinct was to invite our teacher Gelek Rimpoche to visit the premises. We hoped that the location might be an appropriate center for his teachings in the West. Kyabje Gelek Rimpoche was among the last generation of lamas educated at the Draping Monastery in Tibet before the Chinese invasion in 1959. Forced to flee to India during that year, he later gave up monastic life to better serve the lay community of Tibetan Buddhist practitioners in exile. It was an ironic turn of events that we were bringing Rimpoche back to a former monastery, so that it might provide a place for his teachings to the lay community. After much reflection, Rimpoche felt that we had an opportunity to create something larger than a center for his own teachings. He encouraged us to build an Institute that would serve a broader community of seekers from all faiths—a place that would nurture the wisdom that comes from contemplation, and its application to civil society and the environment. And so, with Rimpoche’s blessing, the Garrison Institute was born. Rimpoche went on to serve on the Institute’s founding board and as our first spiritual advisor. He advised us on all issues, sacred and mundane—from the Buddha statue in the meditation hall, to programming and personnel. For the first ten years of the Institute’s existence, Rimpoche led a Spring and Fall retreat, during which he explained ancient Buddhist texts with clarity, joy, and wisdom. Always accessible, he would take his meals at the table closest to the door, where students could sit down next to him to talk about the teachings, their personal lives, or, Rimpoche’s favorite subject when he wasn’t on the teaching cushion, politics. Although he has left this realm, Rimpoche has given us a vast legacy through his teachings, which will continue to deeply enrich our lives. Below is an excerpt from one such teaching that Rimpoche delivered at the Garrison Institute in May 2007. If you are reading this, perhaps it is because you are trying to do something more with your life. You know how to survive, to find food, clothing and shelter. But you want to do more than just make money. You want to find happiness, you want to find peace, you want to become a better person. How do we do that? Through spiritual practice. How is spiritual practice accomplished? Through the mind—through developing its capacities for total wisdom and unconditional love and compassion. But before you accomplish much of anything with spiritual practice, you first need to know what the material is you’re working with in order to develop it to its capacity. So what is the mind? It’s not the brain. A brain with no mind is just a dead brain. It’s part of a corpse. Where is the mind? If you look for it, you can’t find it. It has no form, its nature is more like light than like matter. There is no single place you can point to and say, “This is it—this is the mind.” But we can talk about it in terms of qualities. The mind has the capacity to see or know. It is clear and seeing. The mind takes in what it encounters in an instant, and it is much more complex and sophisticated than any computer. It has a vast capacity for taking in what it encounters almost as an impression. In fact, because the nature of the mind is clear and limitless, it has the capacity to know reality completely and accurately. The fullest capacity of the mind is full enlightenment—total knowledge arrived at through unconditional, unlimited love and compassion. But the mind’s full capacity can become obscured. To help us make sense of what the mind has taken in, the mental faculties come into play. The mental faculties are the properties of the mind that further qualify and influence how the mind perceives various objects. Have we seen this before? Do we know the color? Can we distinguish it from something else? Can we understand that the four black circles and a metal box on top of them with doors and glass moving toward us at a high speed is a car? It’s the job of the mental faculties to understand such things. When we have problems, it is because something has gone wrong with the functioning of the mental faculties. Because of negativities such as anger, obsession, or jealousy—things that distort what we see—the mind’s ability to know reality may become blocked. Every benefit and every misery we have comes from the mind. If we’re miserable about one thing, then it triggers misery about another thing, and then another thing, and then you feel terrible all the time. If we’re happy and things are going great, then it’s also because of the mind. If anything in the future is going to be good or bad, it is influenced by the mind. So if there’s spiritual development, it comes from the mind. To achieve our spiritual goals, we have to find a way to get rid of the mind’s obscurations. Contemplative practice serves this purpose. The opportunity to practice is a precious opportunity for us all. 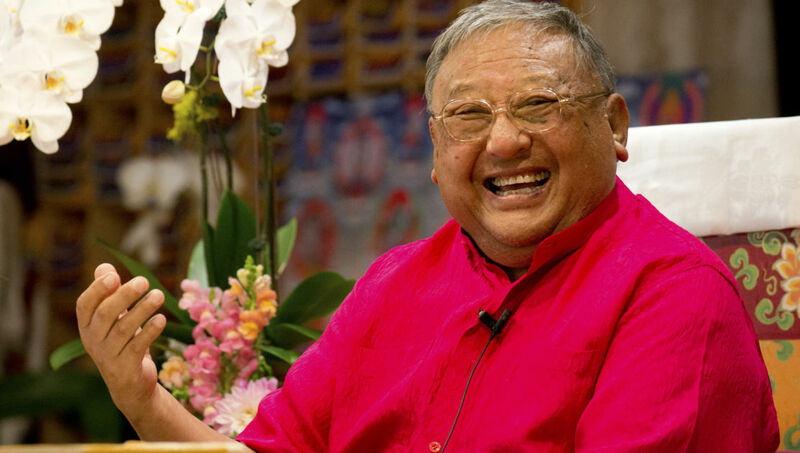 If you would like to post a remembrance of Gelek Rimpoche, please visit the Jewel Heart website. Jonathan and Diana Rose are co-founders of the Garrison Institute.